Robert climbs the Cayan Tower. Cayan Group grabbed headlines worldwide last month by announcing the launch of its latest Dh1-billion ($272.255 million) residential and serviced apartment building amidst a world-record attempt by French climber Alain Robert – popularly known as ‘Spiderman’ – to climb up its twisted Cayan Tower. The event was planned by the premier property developer and real estate investment group to coincide with the launch of its Cayan Cantara residential and serviced apartment building project in Dubai’s Umm Suqeim area. Cayan Group’s new iconic project will be situated in close proximity to other developments including Mohamed Bin Rashid City, Jumeirah Village Circle, Motor City, Dubai Hills and Arabian Ranches and will incorporate smart layouts and amenities that will make the tenant’s living experience both comfortable and luxurious. Founded in 2004, Cayan Group has a long track record of developing a range of well-known real estate projects across the region, notably the Cayan Tower located in the Dubai Marina, Silverene Towers, The Jewels and Dorrabay all located in the UAE, as well as Layaly Compound and Samaya in Saudi Arabia and Broumana Lands in Lebanon. 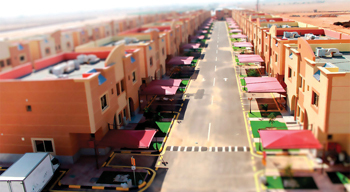 The First Investor (TFI), the investment banking division of Barwa Bank Group (BBG), has acquired a SR300-million ($80 million) residential compound in Riyadh, Saudi Arabia. The compound has various facilities. The compound was acquired by Manazel Compounds Real Estate, an entity that has been incorporated for the compounds acquisition. An investment has been made by TFI, Barwa Bank, Tanween alongside strategic partner Warba Bank of Kuwait into the compound. Financing facility for the acquisition has been provided by Alinma Bank. The development is a newly built compound which is strategically located in Riyadh within the vicinity of two major landmarks – the upcoming metro station that directly leads to Amir Khalid Airport and the Princess Noura University. Manazel Compounds has been able to lease the compound to Saudi Arabian Airlines, which is currently accommodating over 1,000 cabin crew staff there. The compound also hosts a number of recreational facilities. Aldar Properties, Abu Dhabi’s leading property development, investment and management company, has flagged off construction at the Ansam residential development on Yas Island in the UAE emirate. Ansam is currently the first and only residential development on Yas Island that can be purchased by both Emiratis and expatriates. The development features four Andalusian-style apartment buildings comprising more than 500 apartments overlooking the Yas Links golf course and the Yas Island waterfront. Owing to the quality of the apartments on offer, all units available for sale were sold out on the first day of sales in June 2014 and will be handed over to owners in 2017. Residents at Ansam will be able to experience resort-style living amongst some of Abu Dhabi’s most popular leisure and entertainment venues. The development is close to the Yas Marina Formula One Circuit, Yas Waterworld, the Ferrari World theme park, Yas Mall, Yas Viceroy, Yas Marina and the Yas Links golf club. Each Ansam building will be integrated into a landscaped setting and provide high-quality amenities, such as barbeque areas, infinity pools, kids’ pools, gymnasiums, and multi-purpose halls to host indoor functions.